Chartered to build a high-velocity development team to reinvent and redesign the effective but slow-selling Guru dental patient education and case acceptance tool. As VP Product Development, I led team-building, product design, and user experience. The product was migrated from an earlier VB to .NET with a Silverlight interface, allowing us to keep the patented Stop-Draw-Teach education elements while adding Kinect gestural capabilities. The heavily text-based interface was slimmed with a context-based iconic one, significantly trimming the excess menuing by tying the patient management system into the video data. Working from the standpoint of two primary variables – the dentist’s “gloved environment” and the “nervous, income-limited” patient, my team re-designed the interface to be less daunting (less “scary”) and more focused. Drop-downs and text menus became icons, flows were re-designed to increase prominence of actions with higher usage rates, integration with patient management reduced the bulk of the menu trees, and the primary focal point – the video with stop-draw-motion – was increased in size to give both users a more enjoyable experience. A very short timeline (5 months) and a small team coupled with significant technological hurdles were overcome by reusing an architecture the team was familiar with (from working together on streaming media interfaces). 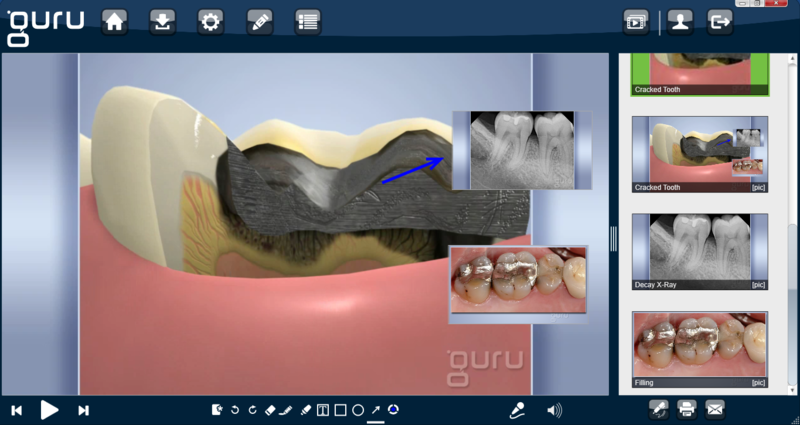 For more information on the Guru Dental project, download the case study.